hi some advice on using drums in reaper please. when i import drum loops into reaper (either from my drum program bfd eco or a sample using the media explorer within reaper) is there a way i can make them half time tempo or double time tempo or set the tempo which they will be dropped in so that it does this? Under "close grooves" you find tempo 1/2, 1 and 2. Halftime - Normal - Double time. Looks like our friend Ville has saved the day. Tell me man, have you tried to write your own grooves? 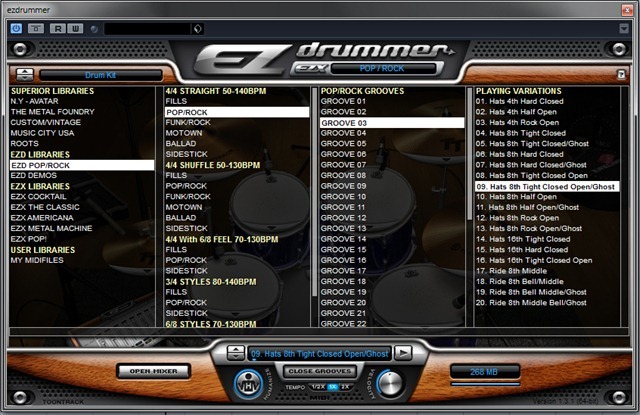 Writing drums can offer a whole new perspective on building musical ideas, rather than just using pre-made grooves. thanks guys i dont know how i was missing that box! hi cosmin, yeah ive been experimenting with drums alot the last 6 months to the point i seem to be spending more time with programming drums than guitar. ive been programming midi, its getting quicker but ive spent alot more time on it than i wanted. recently downloaded lots of loops to try. trouble is the loops never sound good together! It looks like the easy way around, but it really isn't Drums are to serve the music, not viceversa I for one, when I am writing a riff, for instance, I will build the drum track to serve THAT riff and nothing else. Well, that's proof enough that the music should come first and then the skeleton. Although, there are cases in which songs will start from a drum groove - I once saw an interview with Filter, an alternative rock band, and they stated that usually they begin writing from a drum groove.